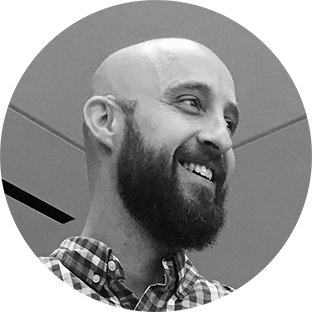 Design thinking for the masses – Dave Harper: UX design leader and practitioner, creating and delivering products that people love. 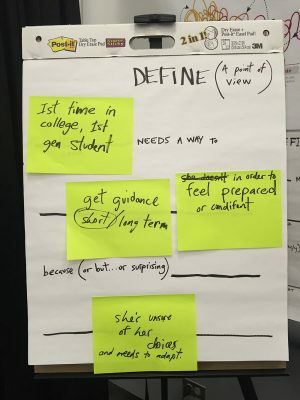 The discipline of user experience design and the process of how UX designers work is often a mystery, misunderstood and not fully valued within companies that have UX teams. Additionally, clients and end-users may not have any idea how their products get made and feel out of touch with all that goes into it. 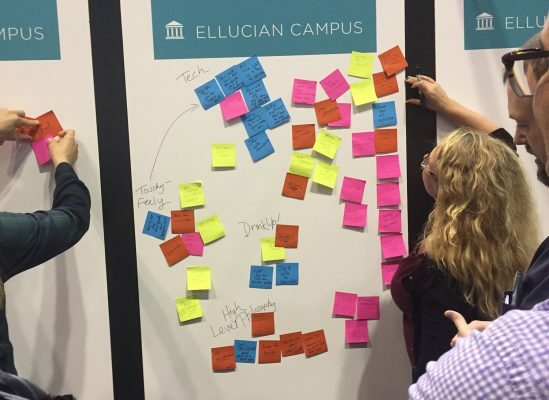 While working with Ellucian, a software and services provider for higher education, I worked closely with a group of UX designers to find ways of elevating the importance of user experience within the company and externally with clients and end-users. 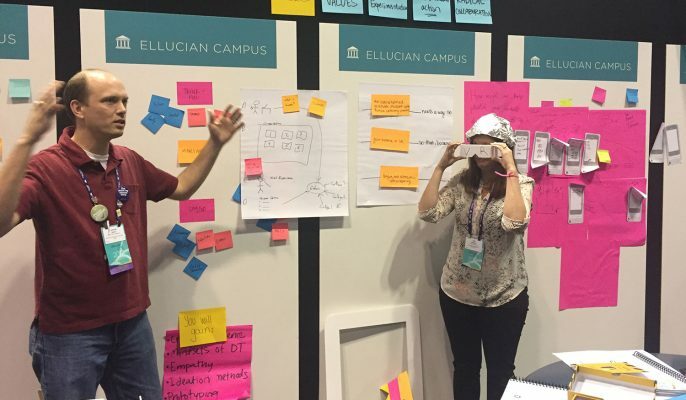 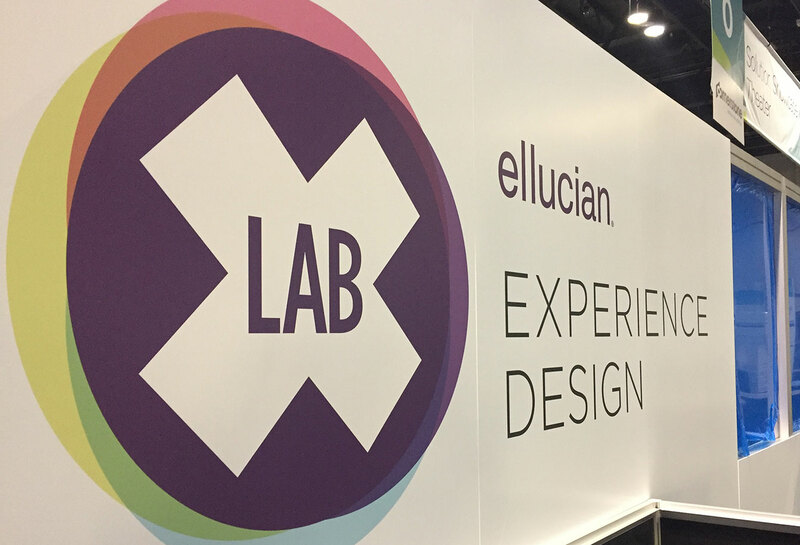 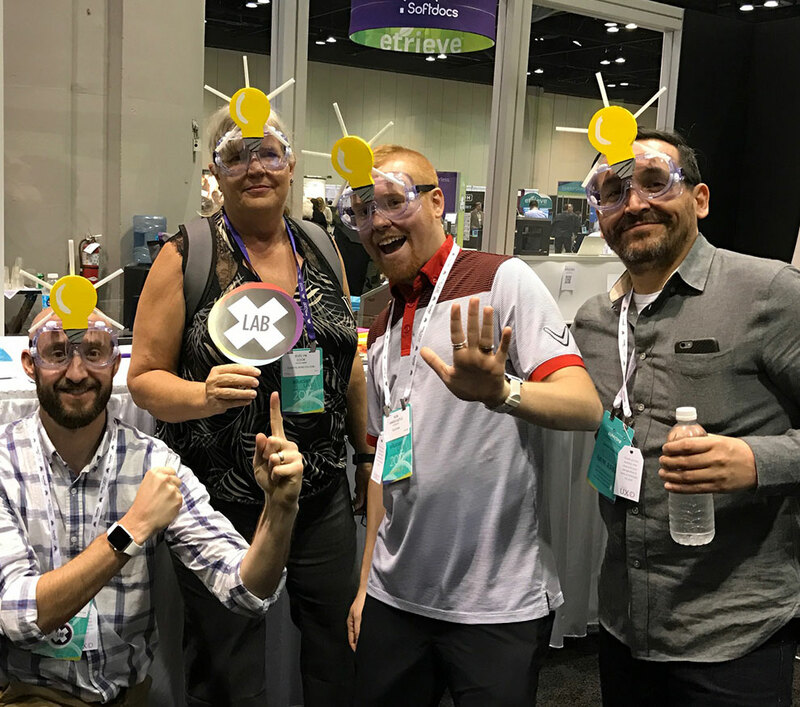 One of our objectives was to conduct design thinking workshops at Ellucian’s annual user conference, Ellucian Live. 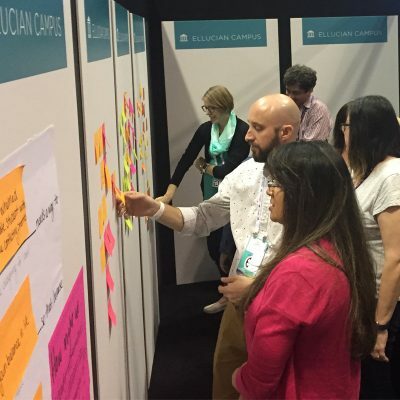 Each year this conference brings together approximately 8,000 attendees from 1,300 higher education institutions. 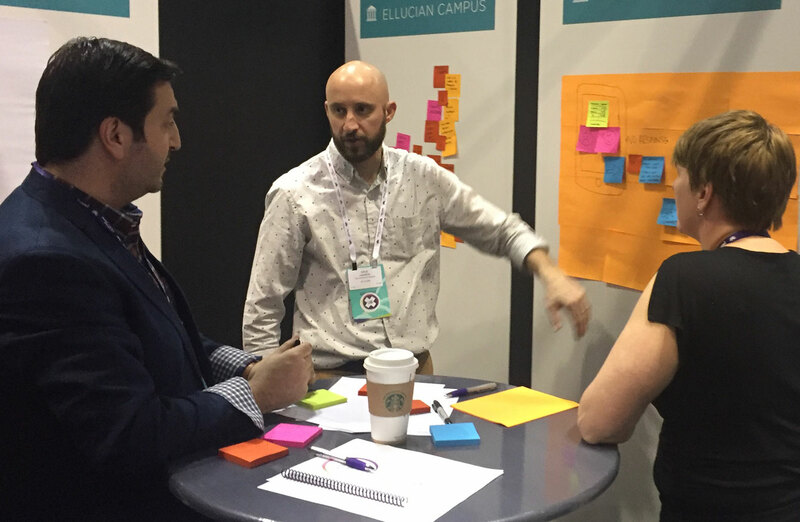 Our UX team conducted design thinking workshops as a way to engage directly with users, share the design methodology we use for creating products, and teach participants how to use design thinking for solving everyday problems. 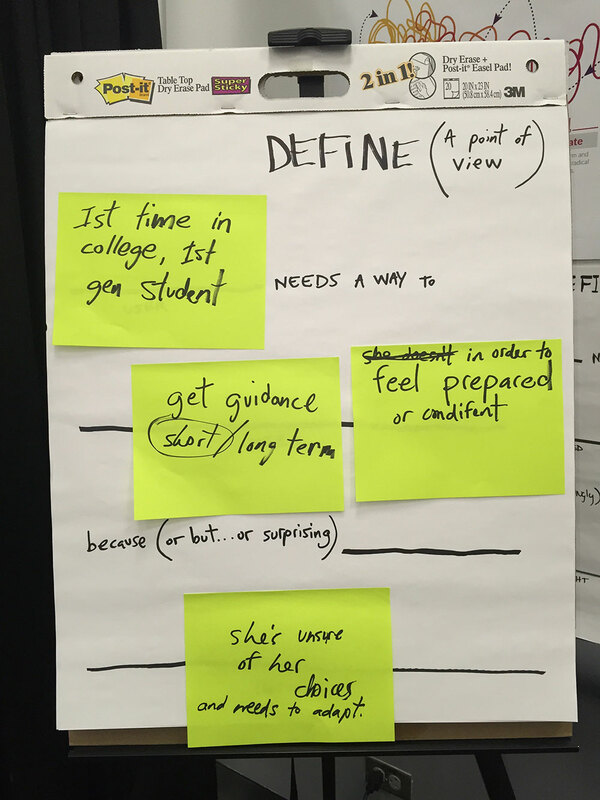 Participants learned: The importance of gaining empathy and understanding for people, how to develop a problem statement, rapid diverging and converging of ideas, and storytelling through prototyping. 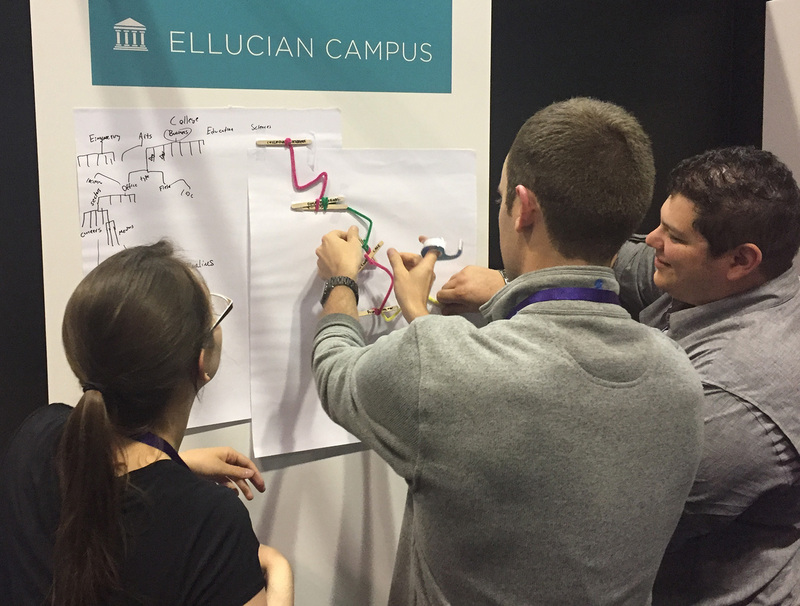 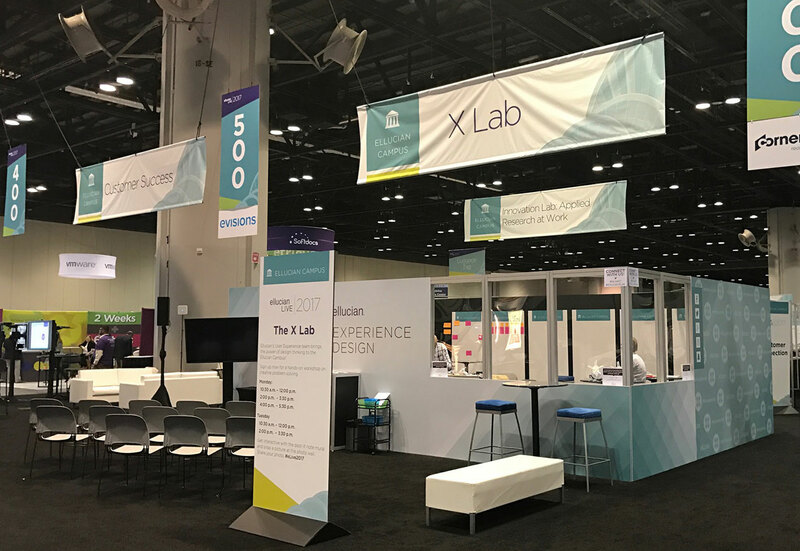 As a part of our design thinking team for Ellucian Live, I worked closely with my teammates to conceive the workshop format, flow and space. 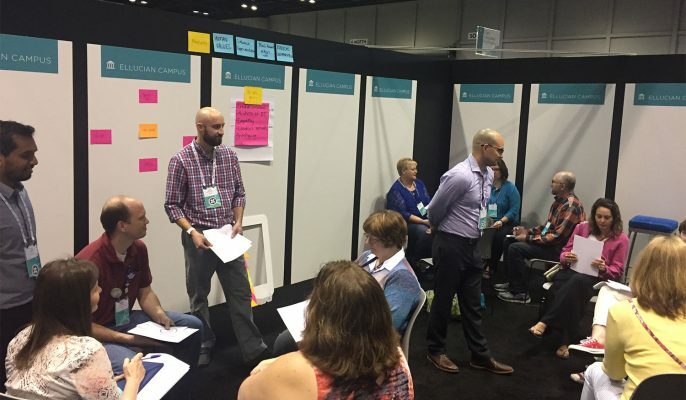 I led workshops and assisted participants as a design thinking coach. To help us determine the format and flow of the workshop, we used Mural to help us organize our thoughts. 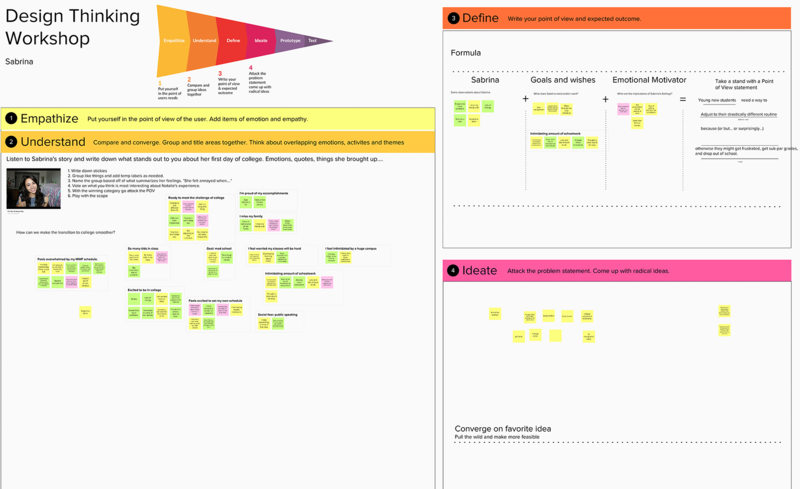 We put together a design thinking template and ran practice sessions virtually with internal teams. After the conference, our design thinking process template continued to be a valuable tool for using with product teams internally. 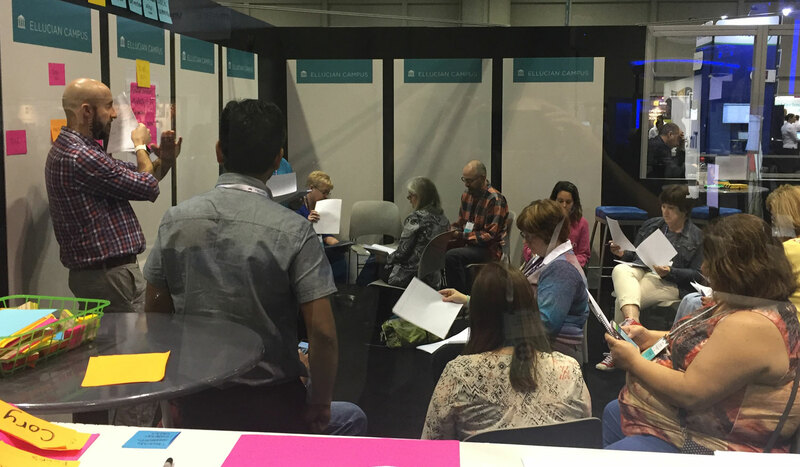 The first year we ran our workshops a bit off the path of the high traffic conference areas. But, our attendees took to social media and raved about their experience. 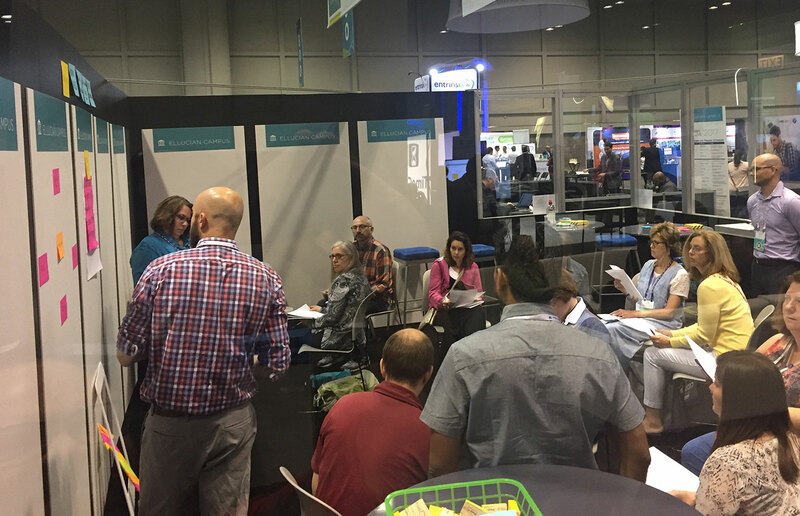 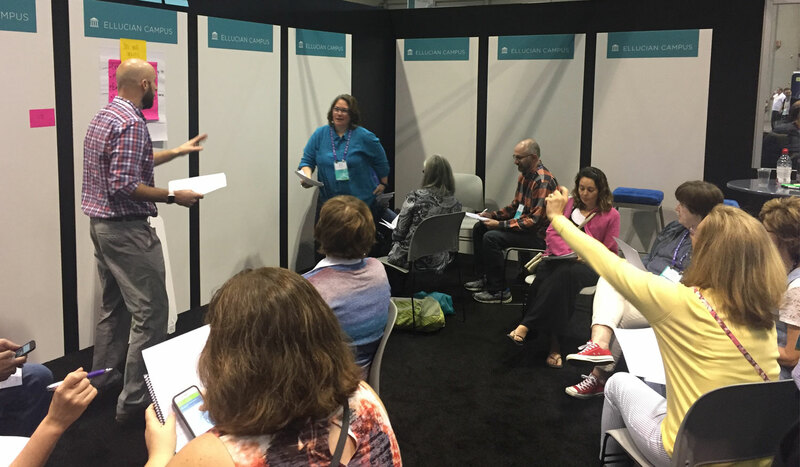 As a result, the following year our workshop space was placed in the center of the conference exhibition floor space, making our workshops highly visible and well attended. 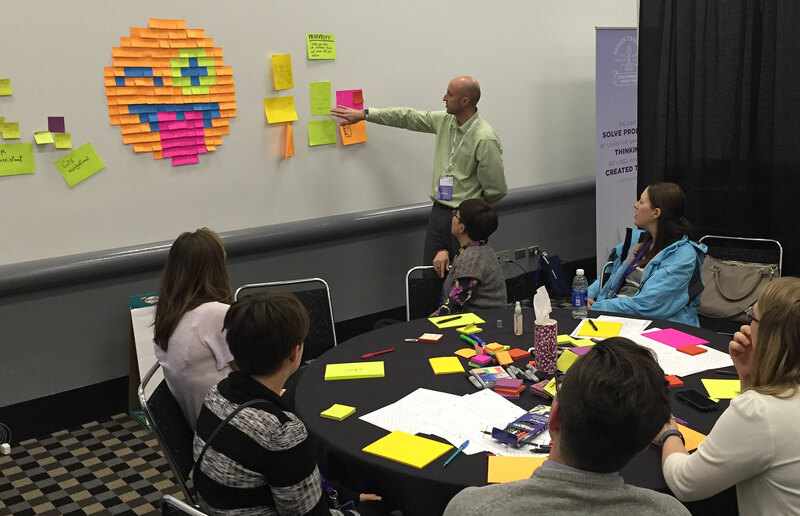 Participants had access to crafting supplies to help facilitate and encourage the building of physical prototypes. Each team presented their prototypes through demonstration and storytelling.